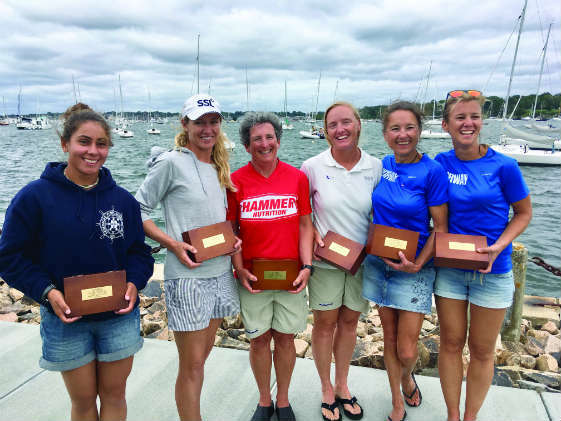 Longtime SpinSheet “Small Boat Scene” columnist Kim Couranz and her skipper Carol Cronin won the Women’s Snipe World Championships in Newport, RI, August 16-19. Of the 32 competing boats, among them competitors from Norway, Portugal, Brazil, and the Bahamas, Cronin and Couranz sailed the most consistently, winning by one point over the Portuguese team of Mafalda Pires de Lima and Kathleen Tocke. Cronin represented the United States at the 2004 Olympics in the Yngling and has won many national and international titles in the Snipe, J/22, J/24, and on the women’s match racing circuit. She is also a book author and blogger; find her five lessons learned on her blog here. As well as being a Snipe racer, Couranz is an accomplished Laser Radial sailor, who won her division at Masters Laser Radial Worlds in 2013 in Oman and in Kingston, Ontario, in 2015. She is also commodore of Severn Sailing Association. Together, Cronin and Couranz have won five U.S. Women’s Nationals and have twice qualified for and sailed in coed Snipe Worlds. Congratulations, Carol and Kim, on yet another tremendous success!